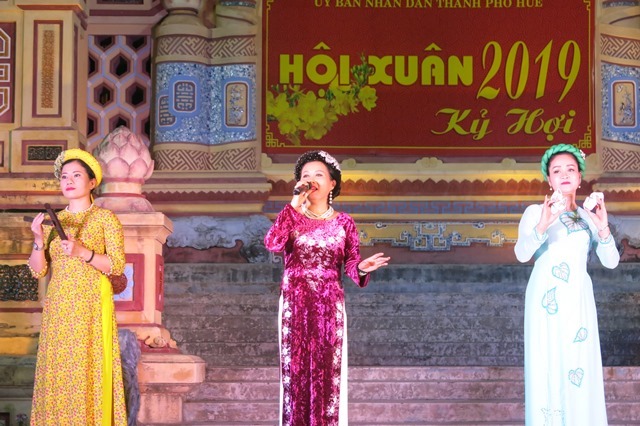 In the evening of the first day of the Lunar New Year (February 5), Ca Hue (Hue Tranditional Singing) performance to welcome 2019 Ky Hoi Spring took place on the stage at Quoc Hoc monument, Ly Tu Trong park. 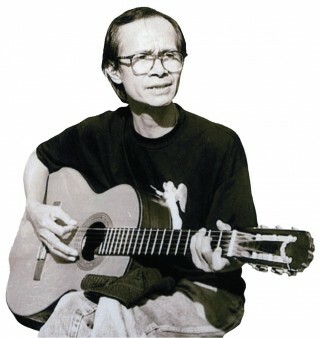 In the program, the friendly songs were sent to the listeners by artists of Ca Hue Club with the melodious scales of đàn tranh (16-chord zither), đàn tỳ bà (a Vietnamese traditional plucked string instrument), đàn nhị (erhu - a Vietnamese bowed string instrument with two strings), đàn nguyệt (moon-shaped two-string lute), sáo trúc (bamboo flute) and đàn bầu (a Vietnam’s indigenous monochord zither), etc. 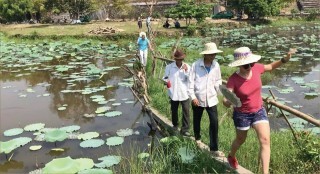 Ca Hue songs to welcome new spring, though familiar, are still sweet and bustling, giving people a happy atmosphere of the new spring. 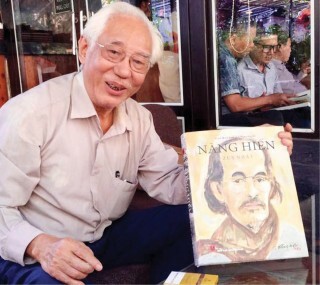 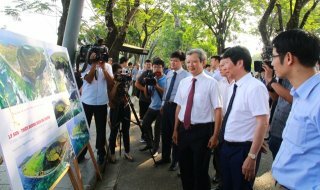 Besides the voices of veteran artistes and artists, such as Ms. Thanh Tam and Ms. Kim Vang – the artistes, Meritorious Artist Thu Hang, Meritorious Artist Mai Le and Quynh Hoa ... there were also young artists bringing to the audience a colorful Ca Hue program. 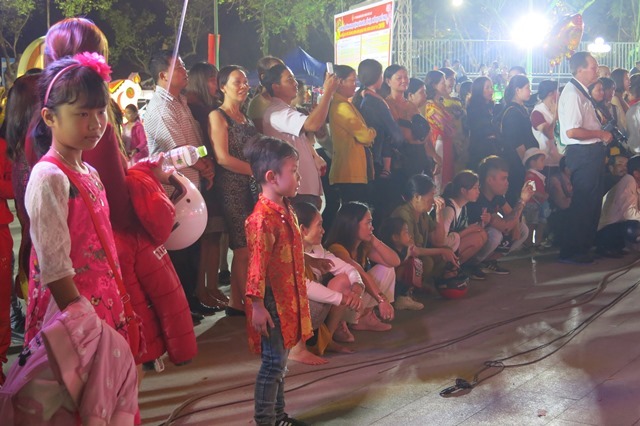 Ms. Kim Vang shared: "Although Tet holidays are very busy ones, we still come here to perform Ca Hue to the public, contributing to the bustling atmosphere for the traditional New Year. 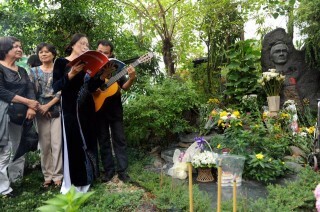 A lot of spectators stayed to watch until the end of the program. 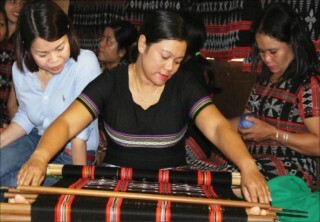 It is a meaningful gift to the artistes and artists on the first day of the new year ". 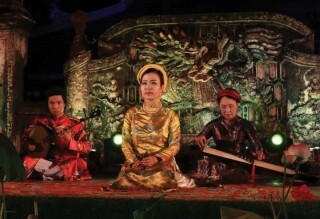 With the desire to bring the official Ca Hue closer to the audience, adding more ‘spring colour’ in the traditional Tet holidays, this is the second year Ca Hue Club performed at Ly Tu Trong Park. 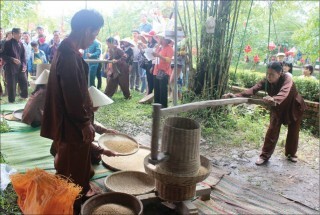 In the bustling spring asmosphere in the park, the Ca Hue show attracted a lot of people and visitors.